These eight myths about serious mental illness cause Congress to waste money and fail to implement policies that can improve care and keep patients public and police safer. 100% of adults can have their mental health improved. Twenty percent of adults over 18 have a diagnosable mental illness. But serious mental illnesses are rare. Only 4.1% have a serious mental illness including the 1.1% of adults with schizophrenia and the 2.2% with severe bipolar disorder. Until the early 1960s virtually all mental health expenditures were spent on seriously ill people in state psychiatric hospitals, but at the behest of the mental health industry, federal and state dollars are now spent improving the mental health of all citizens including people without mental illness. This policy diverts funds from care of the seriously mentally ill.
Studies that show no association between mental illness and violence are flawed. These studies are almost always of the treated mentally ill. They show that medications work, not that mental illness and violence aren’t connected. Studies also dilute their results by studying the 20% with any mental illness instead of the 4.1% with serious mental illness. Because the studies are typically done in the uninstitutionalized community, they exclude the violent who are involuntarily committed, incarcerated, hospitalized, or who have killed themselves. Numerous studies show that people with untreated serious mental illness are as a group more prone to violence than others.. A meta-analysis of 204 studies of psychosis found it “was significantly associated with a 49%–68% increase in the odds of violence.” A review of 22 studies published between 1990 and 2004 concluded that “major mental disorders, per se, especially schizophrenia, even without alcohol or drug abuse, are indeed associated with higher risks for interpersonal violence.” Researcher John Monahan found, "The data that have recently become available, fairly read, suggest the one conclusion I did not want to reach…no matter how many social or demographic factors are statistically taken into account, there appears to be a relationship between mental disorder and violent behavior." Psychiatric hospitals and community services serve two mutually exclusive populations. Hospitals serve those who need hospitalization, while community services serve those who don’t. Even with perfect community services in place, some people will need to be hospitalized. The minimum number of beds needed to serve the most seriously mentally ill is 147,000, roughly 50 beds per 100,000 citizens. We are therefore short 95,000 psychiatric beds. Because of this shortage, 360,000 individuals with mental illness are behind bars and 200,000 are homeless. Until there are better treatments, we need hospitals. Today, community services are not a substitute for hospitals, mainly because they only accept those well enough to recognize their need for treatment. People who are not well-enough to self-direct their own care, or are highly symptomatic, or have a criminal history, generally will not be welcomed by community-based programs. 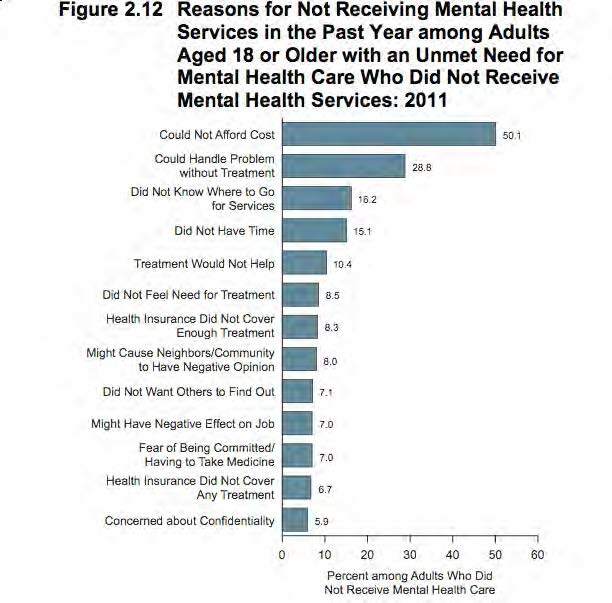 And even if they gain access, community services do not offer the evidence-based treatment that’s needed to improve meaningful outcomes for the most seriously ill. Peer-support--whereby someone with mental illness is placed under the guidance of someone else who’s only qualification they too have a mental illness—is currently a popular community based service. But peer support has not been proven to reduce homelessness, suicide, arrest or incarceration of the seriously ill. Likewise, 90% of the most seriously ill, will not recover enough to become competitively employed so job training and back-to-school programs are of little utility. We have two mental health systems today, serving two mutually exclusive populations: Community programs serve those who seek and accept treatment. Those who refuse, or are too sick to seek treatment voluntarily, become a law enforcement responsibility. …(M)ental health officials seem unwilling to recognize or take responsibility for this second more symptomatic group. Not everyone can accept voluntary treatment. Some people will always have hallucinations, delusions and/or anosognosia. For them, lack of voluntary treatment means no treatment. John Hinckley ‘knew’ the best way to get a date with Jodi Foster was to shoot Ronald Reagan. Some seriously ill people need involuntary interventions to prevent the worst from happening. Assisted Outpatient Treatment (AOT) is an involuntary intervention that is very humane and less restrictive than anything else now being offered. AOT is limited to the small group of those with serious mental illness who have already accumulated multiple prior arrests, incarcerations or hospitalizations caused by going off treatment. In those limited cases-after full due process- a judge can order the ill individual to stay in mandated and monitored treatment as a condition for living in the community and order he mental health system to provide the necessary treatment. Perpetration studies usually exclude persons with mental illness who abuse substances and therefore artificially lower rates of perpetration. Conversely, the victimization studies used for comparison include people with who abuse substances which raises victimization rates. The first study of equivalent populations found people with bipolar disorder and major depression are more likely to cause injury than receive it. [i] However, the ratio of perpetration to victimization is largely irrelevant. Treatment can reduce both. The causes serious mental illnesses like schizophrenia, bipolar disorder and severe major depression remain unknown and therefore we can’t prevent them. No one can predict who will develop mental illness until the symptoms become manifest. Poverty, lower education and broken families may be associated with serious mental illness but are not known to be causal. Genetics play a role, but it is not well understood. The Substance Abuse and Mental Health Services Administration (SAMHSA) and California’s Mental Health Services Act Oversight and Accountability Commission (MHSOAC) allocate millions to mental health programs that claim they can predict or prevent serious mental illness. To improve care for the most seriously mentally ill, we have to fund science, not mythology. The “Helping Families in Mental Health Crisis Act“ (HR3717) introduced by Rep. Tim Murphy along with 73 co-sponsors in both parties does that. [i] Sarah L. Desmarais, Richard A. Van Dorn, Kiersten L. Johnson, Kevin J. Grimm, Kevin S. Douglas, and Marvin S. Swartz. (2014). Community Violence Perpetration and Victimization Among Adults With Mental Illnesses. American Journal of Public Health. Like many studies of violence among persons with mental illness, this one excluded persons with mental illness in jails, prisons and those who were involuntarily committed. This artificially lowered violence rates by excluding those most likely to be violent. The significant finding that people with mental illness were more likely to perpetrate violence than be victimized by it was in the report, but not the abstract. The authors created two definitions of “violence”. One definition (“community violence”) did not require having received or given an injury. The other definition ("violence") did. The abstract focused on community violence--violence without injury--and reported that people with mental illness are more likely to be victims than perpetrators. But when injury occurred more persons with mental illness were perpetrators of injury-causing violence (8.7%) than victims of injury causing violence (7.5%). Results like that should be highlighted, not buried. DJ Jaffe is Executive Director of Mental Illness Policy Org., a non-partisan, science-based think tank on serious mental illness. The thing that unfair when your going though a crisis and call ask ambulance service dispatch ems there on the way but never come. Two officer say it takes two hours for ambulance. I was out side .my son tried to say up stairs for over 40min .and came down stairs on elevator I said to the two officers this is my son in hallway as he got off elevator in building .I said to the two officer this is my son . NYPD said not a thing .Son was going the a crisis and needed treatment .the two officer start following and bumping my son cape saying stop touching me. no ambulance I go on my own.my son was feeling afraid and black out. This unfair when happened. I no this is wrong I told the two officer my son always got the team that why I come out to see that he gets help. the officer also there just doing there job .there going up stair I if your going up will take to him to the hospital no were not taking him to a hospital .I said to the two officer before my came please do this please I start crying. and knew that there were bulling him and do the wrong thing to mentally people my son black out .I blame the system .a disaster that could of been avoid .This is unfair what happened to my son. I feel so bad about this .It not like these two officer were not were of what was going on I talk to them over 37min unfair justice. This wrong when an officer get award for wrong doing .don't under stand these. why follow a mentally ill person down a street bumping and cause a disaster. They had a chance to help when my son got of elevator. This is not right. the jail has beat on my son broke his noise and macs . places in box 500 days plus600 day booth visit .bad meds..to up sit with the system. this should never happen to anyone.it hurts so bad. I say why my son .you ask and the system plays a dirty game and gets away with it .My son is under the Kendra law .officers need better training in dealing with this group of people. when people want help there think twice . I understand and have repeatedly posted comments about the problem with assertations that the SMI are no more violent than the general public. It is a simple process to see their OVER-REPRESENTATION among those capturing headlines for "shooting sprees." I'm reminded this is stigmatizing. I'm reminded that more violence is done TO than BY the SMI. It is like violence ON them is a reason to be concerned and to push for treatment, or to spend the money on telling others what they should not pick on the SMI...but talking of how their crimes get them in serious legal problems? too stigmatizing to mention!!! i must be a hater, etc.. So putting aside the looking from the correct end of the tele/microscope...it's mind boggling to see that the states are so cooked in these other comparisons,. Our friend James Coyne must read them and mutter about crimes against science, about high treason against staticstics. I now know what I read was not an anomaly. It was a "research" on this topic in which the criterion was tghat the crimes had to be due to the illness. all crimes/violence that was not directly resultant of the symptoms were not counted. I will have to go back and spend the time over what was a very bothersome idea. But I thought it a mere single "study" and not worth the time. Can you tell me a crime that is related to SMI? and not to "other" people? perhaps ah...assaults on mental health staffs? that's one....is it a crime to go off meds? we know it "leads to " crimes...but our researchers were not looking at thqat! Oilier and oilier, these snake oil folks. and all this gets into minds as accepted truth (along with the rest of these myths) and gets written to representatives as part of why to not support HR3717. Meanwhile SMI are supported to refuse meds, institutional treatment and such "coersions", even as they are supported to choose incarceration instead. of course its not put that way. Its presented as being a self determining fully rational choice by a consumer of goods, of a (non-hierarchal) peer supported "bill of goods", and thee bads,...things like dying in a mugging (which was so usefull in refuting the SMI as criminal) are not brought up as a possible consequence, incarceration is not mentioned , not in a jail at least...I better quit, I'm getting "started" on the whole ball of wax resistance...snake oil! Get another expert's opinion, please! This article is such a problem that I will simply state (so I can calm down and sleep tonight!) that this journal will do an injustice to its readers if it does not invite another writer to respond to Mr. Jaffe's allegations. There are studies that have differing results than these Jaffe describes. We all have our experts. WE need a law that will respect the full humanity of people with mental health challenges and respond to circumstances such as were described by Vearry Hale, above. THIS is a reality far too many American citizens and their families experience! Until our government funds services that are engaging, respectful, and safe, why would we even think of developing our capacity to force people? This world is fallen enough. This law would sink it deeper.